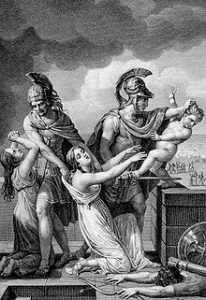 Greek  Myths,  Modern Refugees: Reading from Greek Tragedy on refugees, Migrants, and Immigrants in the Ancient World. Presented by the BYU  Eta Sigma Phi Classics Club. PROVO, Utah (February 19, 2019) Hauntingly beautiful retellings of people ravaged by war echoed in the JFSB auditorium on February 19th. The Eta Sigma Phi Classics Club and theater students recited passages from Euripides’ Trojan Women, Andromache, Helen, and Aeschylus’ Suppliants. When participants were asked what they hoped the response of this performance would be, one participant said that they hoped “people would understand how these tragedies and stories are still applicable today and how we can use these wonderful tools we’ve had at our fingertips for over 2000 years.” Greek tragedy isn’t dead, it still has wonderful themes and issues that can emphasize current issues—especially the refugee crisis. The hope is that readings like this will continue giving a voice to those who aren’t heard, as well as encouraging the connection between Greek tragedy and modern-day issues.